Denis Savard and Jonathan Toews, each chosen third overall in his draft year, are two of the Blackhawks' best draft picks. Since the NHL Entry Draft was instituted in 1963, the annual event’s importance has grown in both popularity and importance; franchises can be built on just a few good drafts, and in the age of the hard salary cap, finding talented young players is a top priority for NHL teams. In the 47 years of the draft, the Blackhawks have discovered and drafted some of the best players to ever don the Indian Head sweater and even some of the greatest of their generation. Denis Savard (3rd overall, 1980): While fellow 1980 draft pick Troy Murray could have easily make this list as well, there’s no denying Savard’s impact on the Blackhawks and the sport as a whole. Savard played 12 of his 17-year NHL career in Chicago, ranking fourth in team history in goals (377) and second in assists (719). The seven-time All-Star scored 1,338 points overall and was inducted into the Hall of Fame in 2000. Jeremy Roenick (8th overall, 1988): One of the best American-born players in NHL history, Roenick was arguably the Blackhawks' most dangerous goal-scorer since the days of Bobby Hull. J.R. eclipsed the 50-goal plateau twice in Chicago – the only Blackhawk besides Hull with multiple 50-goal seasons – and scored 596 points in 524 Blackhawks games. Roenick was also a major part of the 1991 Blackhawks team that won the President's Trophy and appeared with Chicago in the 1992 Stanley Cup Final. Jonathan Toews (3rd overall, 2006): From his first NHL goal – scored on his first NHL shot – Toews has been a major reason for the Blackhawks’ success. Just four seasons into his professional career, Toews has already amassed 267 regular-season points in 302 games. 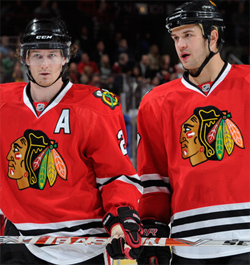 He also captained the Hawks to the 2010 Stanley Cup title, being named Playoffs MVP along the way. Steve Larmer (120th overall, 1980): One of the Blackhawks’ best two-way players ever, and a strong, powerful counterpoint to his slight, speedy linemate Savard, Steve Larmer was a dangerous scorer and fierce competitor through the 1980s and early 1990s. Larmer’s 406 goals ranks third all-time in Chicago Blackhawks history, and his nine career Blackhawks hat tricks is fourth behind only Hull, Stan Mikita and Savard. Larmer never scored fewer than 29 goals in any season with the Blackhawks. Eddie Olczyk (3rd overall, 1984): Long before he was coining catch-phrases in the broadcast booth, "Edzo" had a long NHL career, which started with his hometown Chicago Blackhawks. The Palos Heights, Ill., native played five seasons in the Indian Head sweater, recording a 50-assist season in 1985-86 while playing with fellow “Clydesdale Line” members Troy Murray and Curt Fraser. Olczyk played more than 1,000 NHL games with Chicago, Toronto, Winnipeg, New York, Los Angeles and Pittsburgh, winning a Stanley Cup with the Rangers in 1994. Patrick Kane (1st overall, 2007): A key part of the Blackhawks’ recent resurgence, Patrick Kane has been one of Chicago’s most electric players since he debuted in the 2007-08 season. In four NHL campaigns, Kane has never scored fewer than 70 points and has led the team in assists three times and total points twice. And who can forget the Cup-winning goal in 2010 that ended the Blackhawks’ 49-year championship drought? Darcy Rota (13th overall, 1973): A veteran of 11 NHL seasons, Darcy Rota spent the better part of six campaigns with the Blackhawks, racking up 227 points (117G, 110A), as well as 450 penalty minutes in just 448 games. Rota later played for both the Atlanta Flames and Vancouver Canucks, setting a Vancouver franchise record for goals by a left winger (41 in 1982-83). Eric Daze (90th overall, 1993): A big, strong winger, Eric Daze was one of the Blackhawks’ biggest scoring threats in the late 1990s and early 2000s. Though back injuries cut his career short, Daze scored 226 goals and 172 assists in 601 games in Chicago and took home the MVP award at the 2002 NHL All-Star Game. Ethan Moreau (14th overall, 1994): Though not the scorer he was in junior hockey, Ethan Moreau has proven to be a productive checking-line winger at the NHL level. In his first four seasons with the Blackhawks, Moreau totaled 284 penalty minutes in 210 games. Nine hundred games into his NHL career, Moreau has totaled 1,090 minutes in the box with Chicago, Edmonton and Columbus, helping the Oilers to the Stanley Cup Final in 2006. Phil Russell (13th overall, 1972): One of the greatest enforcers in Blackhawks history, Russell had an underrated scoring touch as well. Russell ranks fifth in Blackhawks history in penalty minutes (1,288 in just 504 games) and holds the team record for penalties in one game (8 vs. Minnesota, 3/26/77). In 1,016 NHL games with Chicago, Atlanta/Calgary, New Jersey and Buffalo, Russell accrued more than 2,000 penalty minutes to go with 424 points (99 G, 325 A) and a +52 plus/minus rating. Doug Wilson (6th overall, 1977): A smart defender with a powerful slapshot, Doug Wilson was a mainstay on the Blackhawks’ blue line in the 1980s. Wilson scored 10 or more goals with the Blackhawks 12 times, posting 40 points or more 11 times. The 1982 Norris Trophy winner still holds the franchise record for goals by a defenseman in one season (39), set that same season. Keith Brown (7th overall, 1979): Another 1980s staple on the back end, Keith Brown didn't spend a minute in the minors, joining the Blackhawks in the 1979-80 season and never looking back. Known as a fierce competitor and solid all-around player, Brown twice scored double-digits in goals and drew 916 penalty minutes in 876 games between Chicago and Florida. Duncan Keith (54th overall, 2002): The longest-tenured current Blackhawk, Duncan Keith has become the team’s blue line ace, leading the league in ice time this season and being looked to as an important part on offense, defense and special teams. The 2010 Norris Trophy winner has tallied 242 points (52G, 190A) in six seasons with the Blackhawks and was the best defenseman for the 2010 Stanley Cup champions. Brent Seabrook (14th overall, 2003): The tough, physical counterpart to speedy defensive partner Keith, Brent Seabrook has been the Blackhawks’ backbone since he joined the squad in 2005-06. “Seabs” has led team defensemen in hits five straight seasons, dating back to 2006-07, and has grown increasingly productive on offense as well, setting career highs in assists, points and power-play goals this season. Niklas Hjalmarsson (108th overall, 2005): Though just two full seasons into his NHL career, Niklas Hjalmarsson has already made a name for himself as a smart, sturdy, stay-at-home defenseman. The 24-year-old Swede has improved his plus/minus rating each of his first four NHL campaigns and led the Blackhawks in blocked shots (166) this season. Corey Crawford (52nd overall, 2003): Though it took him time to reach the NHL, Corey Crawford demonstrated that he belonged when he finally got his chance this past season. In his rookie campaign, Crawford became the first Blackhawk netminder to win 30-plus games since Jocelyn Thibault in 2001-02 and tied a rookie winning streak set by Denis DeJordy in 1964, taking eight straight decisions.